Prime Minister Justin Trudeau has signed a transit funding agreement with B.C. — the first such agreement in Canada. Prime Minister Trudeau arrives at an announcement on a SkyTrain with a TransLink driver, along with Vancouver Mayor Gregor Robertson and B.C. Premier Christy Clark on Thursday. 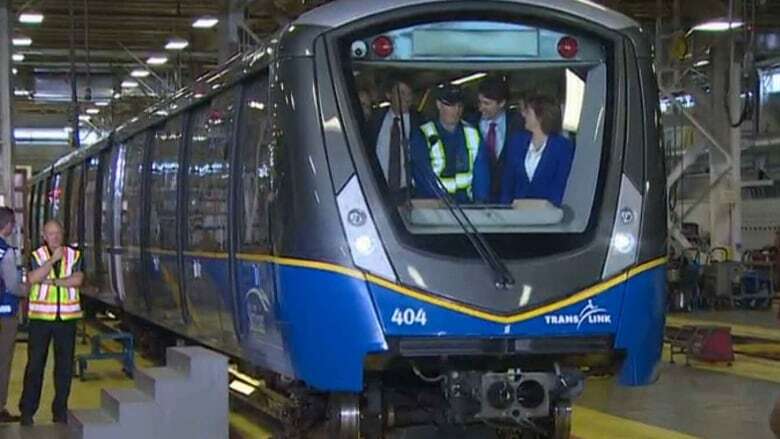 Prime Minister Justin Trudeau and Premier Christy Clark have signed a transit funding agreement totaling over $900 million, making British Columbia the first province in Canada to ratify a bilateral transit deal. Arriving at a Burnaby transit facility on a SkyTrain Thursday morning, Trudeau was joined by Clark, Vancouver Mayor Gregor Robertson and a swath of MPs, MLAs and mayors from across the province. Trudeau said that he was pleased that the first bilateral agreement had been signed with B.C. "Coming to B.C. always feels like coming home," he said. The prime minister said that, after a decade of a lack of investment in infrastructure across the country, his government wants provinces and municipalities to make their own decisions about where the money is best spent. He said that investments in transit improve the quality of life of all Canadians, something he considers essential, and that his government had worked hard to bring together all the parties involved to ratify the earlier pledge. "We are not in the business of making announcements for political capital without delivering on them," he said. "We are in the business of delivering." Clark said she was proud that B.C. was the first province to make the deal. "This is a good investment for the region, the province and for every single Canadian," she said. The investment was "crucial for our quality of life," said Vancouver's mayor. Robertson said that the past six years had seen Metro Vancouver's transit underfunded, and that the system had begun to decline. He said that $57 million of the funding was earmarked for the planning and design of the Broadway subway and Surrey LRT, and that he was looking forward to seeing the projects fully funded and breaking ground in six months time. The Phase One funding was announced previously this year, in both the spring federal budget, and by the province in May. Today's announcement formalizes the commitment, with the federal government providing $460 million and the province $308 million, while municipal contributions will top it up to over $900 million. Trudeau said Thursday that $370 million of the total is earmarked for infrastructure specific to Metro Vancouver, including additional cars for the SkyTrain system, a new West Coast Express train, and a new SeaBus. For the rest of the province, the agreement will mean investments in bus infrastructure upgrades, including more cleaner energy buses, a HandyDart service expansion, and the introduction of new technologies to make bus travel safer for both passengers and drivers. But Unifor — the union representing transit operators — says the funding fails to recognize the need and provide for new buses in Metro Vancouver. "The bus system is the backbone of our transit service and not addressing the bus shortage that exists right now is a significant mistake that must be corrected," said Unifor Local 2200 president Joe Elworthy. The union says it will continue to fight for more buses.